Addressing the launch as Chief Guest, the Prime Minister said the key objective of the five-year NES was to increase the capacity of the local export sector, improve trade performance and competitiveness and ensure different sectors of the economy evolved to grab a share of the global market in reaching the Government’s goal of $28 billion in export revenue by 2022. “This is not only a strategy for national exports, but also a jobs and incomes strategy,” he said. Insisting that NES was an important element in charting the economic growth of Sri Lanka, the Prime Minister notedthat Government officials would meet exporters every six months to discuss and monitor implementation progress. “None of us want any domestic enterprise to be adversely affected. Our domestic enterprises withstood the opening of markets in 1977 and we have grown and are now bringing in for the first time a trade adjustment policy. We’re not opening up tomorrow to destroy them. They create as many jobs as export industries and are an essential part of the economy and they should be assisted to adjust to the new trading environment. The tax incentive available for domestic industries is to become more competitive,” he added. “These are the policies we are following to ensure that the people in this country have better jobs, better incomes, better housing, better education and better healthcare. This is the only way. You can’t have all these without money and you can’t have money if you don’t earn your foreign exchange,” the Prime Minister said. He emphasised that all the developed economies of Asia had become successful today by becoming export economies, particularly South Korea, Singapore and Vietnam. “Sri Lanka was one of the first export economies of Asia in the modern world when we planted tea, rubber and coconut with the same principles of management of commerce and industry in the late 19th Century. In 1977, we launched our wave of the export strategy by initiating an open market economy. However, we haven’t reached that though we started in 1977,” Wickremesinghe pointed out. He stressed that Sri Lanka should have focused on exports despite the war and recalled that when President Jayawardena opened up the economy Sri Lanka started the free trade zones (FTZs) allowing investors to come and produce for exports, while President Premadasa launched the 200 garment industry program which pushed the country as a key player in the Asian apparel exports market. “Some say that we had a war, but President Premadasa pushed the 200 garments program during the war and those in Vavuniya, Anuradhapura and Polonnaruwa were not touched by the war then — that’s a hard fact. No bomb exploded inside a hotel. So we have given excuses for non-performance,” he stated. The Premier expressed disappointment in Sri Lankanot being able to achieve the kind of growth that’s required to give a future to the younger generation even after many years. “We established ourselves in apparel and rubber. We may not have the volumes but we certainly are higher up the value chain. We expanded our rubber-based industries. Thereafter the export push came to an end. We neglected our exports sector and neglected many other sectors and what is the result? Look at Bangladesh, they were the last of the South Asians to open up but where are theytoday and where are we?” he asked. Wickremesinghe said that the country had not really reflected on why it failed to perform, give people better incomes and created more employment opportunities. “We can no longer say we will make shoes to carry on with the apparel. We need to move up the value chain and that is what this Government has started to do,” he stressed. He said that from the time President Maithripala Sirisena took over and formed a government, they pledged themselves to becoming an export country and winning that benefit for its people. “We got GSP+ back which means it’s not merely a few items but a large range of items and may not be a few items in large volumes. It also makes us safer today looking at the global trading environment to specialise in niche markets,” he added. The Prime Minister also highlighted the free trade agreement (FTA) entered into with Singapore, while noting that they were also seeking to deepen trade relations with other economies in the region. “We have China who is talking of an FTA with us; we want to spread that over 10 years. We’re also talking about deepening trade with India. After Singapore FTA, Thailand, Malaysia and Indonesia are keen on FTAs; we are covering the whole Bay of Bengal, which are going to be our new markets,” he stated. With regards to the FTA with Singapore, Wickremesinghe reassured that both countries had agreed that there would be no free movement of people. To drive entrepreneurs, he said the Government recently launched ‘Enterprise Sri Lanka’. “We are opening up new industrial estates. We will establish a development bank but before that we will ensure Rs.10 billion is available to the local industrialists. These are some of the efforts we are taking,” he added. Delegation of the European Union to Sri Lanka and the Maldives Chargé d’ Affaires Paul Godfrey said that since coming to power the Government had been clear in its desire and ambition to move to a more liberal economic model that had export growth as a cornerstone in the quest for growth and greater prosperity for all Sri Lankans. “The Government made a specific request to the EU to provide trade-related assistance. I am pleased to say that today’s event is a fruit of that request thanks to the important facilitation work done by our partners ITC and UNIDO,” he added. He said the EU had already given a huge opportunity for significant growth in exports to the European market through Sri Lanka being re-awarded GSP+. “The EU already accounts for 27% of Sri Lanka’s exports, making it the largest market for their exports. I hope that this strategy can be the platform for increasing that figure and see Sri Lanka take greater advantage of the wider range of product lines under GSP+ to support greater economic diversification,” Godfrey stated. In addition he said reducing the cost for exporters in complying with international standards is an important contribution that NES can drive. The food, spices and ICT sectors were outlined as sectors that had great potential for increasing export in Sri Lanka. He stated that if the Government was to achieve its ambition of Sri Lanka becoming a regional hub for the South Asian region, there needed to be clear advantages for businesses engaged in the country. “The number of important facilitating methods have already been taken, but it is unfortunate that those reforms haven’t yet impacted significantly on the perception of the business environment in the country. Implementation of the existing measures and consistent, concerted and serious action to address the corruption and red tape will be needed if there needs to be clear blue water in business terms as well as in geography between Sri Lanka and its neighbours,” he pointed out. He said the EU would continue to value its partnership with the Government in addressing these challenges. “We will stand steady and continue to support and assist the Government in realising its Vision 2025. We believe the NES will make an important contribution to turning that vision into a reality,” Godfrey added. With the rapid development of trade corridors across the region and growing demands of Asian consumers, International Trade Centre (ITC) Executive Director Arancha Gonzalez expressed confidence that Sri Lanka was strategically positioned in the Indian Ocean to service regional trade and leverage immense trading opportunities going beyond the domestic market. “The current economic reform agenda of Sri Lanka, which aims to transform the country into an open and dynamic trading economy, symbolises a confident nation. Sri Lanka’s dynamic workforce, combined with structured efforts to stimulate innovation and entrepreneurship and growing a dynamic ICT industry, provided with all the right ingredients for the island to create value in regional and global production networks,” she added. She believes the modernisation of Sri Lanka’s trading environment will guide efforts towards diversification and greater local value additions. “With its alignment with the Government’s Vision 2025, the National Trade Policy and the NES is a key enabler of Sri Lankan trade reforms. It is a tool for the country to become a key regional trade hub serving Asia and beyond,” she noted. Gonzalez said she was pleased that implementation had already started with financial allocations from the National Budget 2018, noting that it signified the earnestness of the Government for quickly moving into action. The NES design and management process is led by the Development Strategies and International Trade Ministry and the Sri Lanka Export Development Board (EDB). 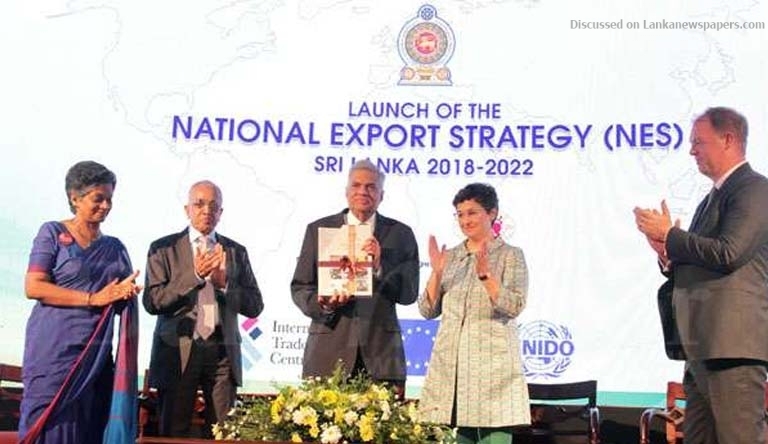 Technical support has been provided by the International Trade Centre (ITC) within the framework of the EU-Sri Lanka Trade-Related Assistance project funded by the European Union. The National Quality Infrastructure Strategy was designed as part of the project in close partnership with the United National Industrial Development Organisation (UNIDO).